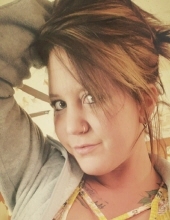 Kristin Nicole Dunniway, 24, of Pekin passed away Tuesday, April 2, 2019 at her residence. She was born January 18, 1995 in Peoria to Thomas J. and Erika Stallings Dunniway. Her grandfathers, Joe Stallings, Tom Dunniway and uncle, Laytn Stallings preceded her in death. She is survived by her sons, Kaiden Brady, Kyler Shue; parents, Thomas (Julie) Dunniway, Erika (Jerry) Goodman; grandparents, Barb Dunniway, Vicki Stallings, John Bush; siblings, Alisha Dunniway, Kalisha Dunniway, Logan Dunniway; step-siblings, Hannah Holmberg, Matthew Holmberg, Tyler Abraham, Trent Goodman and devoted friends and fathers of her sons, Kevin Brady and Ryan Shue. Kristin always looked perfect and had a big smile on her face. She enjoyed shopping especially buying gifts for her family for the holidays. She was a kind and giving person and would help anyone she could. She loved her family especially her sons. Kristin was loved by many and will be greatly missed by all. Cremation has been accorded and a celebration of life will be held at a later date. To send flowers or a remembrance gift to the family of Kristin Dunniway, please visit our Tribute Store. "Email Address" would like to share the life celebration of Kristin Dunniway. Click on the "link" to go to share a favorite memory or leave a condolence message for the family.